I must admit at Christmas I wasn’t feeling my best. Various things were lowering the morale level, one of which was the progression of an elbow injury I picked up in Spain, ripping off a wet hold. It’s quite amazing how big a part of my life feeling strong and fit is. When something compromises it and leaves you worrying about grabbing a hold to aggressively or lifting a heavy bag, it can really put quite a big dent in your confidence. Dealing with an injury is as much about the psychological aspects of adjusting to the new reality as implementing a course of physical rehabilitation work for the tendon. The fact is, tendon injuries, if you get them, are probably going to be with you for a bit. So like it or not, you’re gonna have to get used to it. I’ve tried the other two options (burying head in sand and making the tendon worse, or going cold turkey, and making the tendon worse as well as going completely crazy), they don’t work. The only way to turn an injury woe into a positive is to think up a plan of action that will allow you to keep challenging yourself at the same time as giving the injured strip of collagen some gentle stimulus to reform some steely tensile strength. The best thing is to go somewhere/try something completely different and new. Physically I felt unfit, creaky and worried that I’d forgotten how to move well on the rock altogether. In hindsight I was just super tentative with my elbow. But it was actually nice to try climbing using very little aggression. Of course it wasn’t very effective for climbing hard, but it still taught me new things about my own climbing technique. As ever, the good old British weather dictated the obvious rehabilitation climb to do. A massive high pressure due to sit over the UK for at least two weeks was going to be crap for winter climbing (no snow) but kinda cold for rock climbing in Scotland. 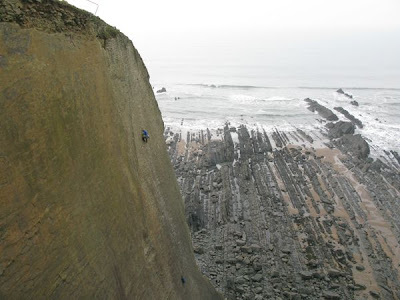 Why not head for a big slab climb in the warmest corner of our isles; Devon. 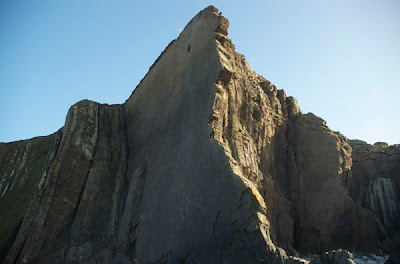 Last Autumn James Pearson made an inspired first ascent of The Walk of Life on the North Devon coast, a well known line I’d been told about by a few people over the years but never got round to doing myself. 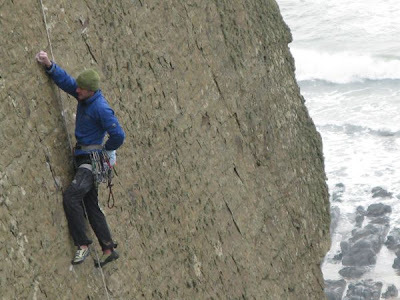 By giving his new route the gobsmackingly high grade of E12 7a, James made a strong statement that he felt he had broken into an entirely new level of world class rock climbing. I couldn’t wait to try the climb and find out just how impossibly difficult an E12 would be. But although the grade indicated it was the hardest climb in the world, it was still a slab, and even if I could just do a few moves on it, it would be inspiring and good learning for me, but not too stressful on my elbow. By Hogmanay I was abseiling down the huge blank sweep of Dyer’s Lookout, seeing the size of the holds on ‘The Walk’ close up. They looked better than I thought! The atmosphere of the cliff makes a big difference to how you feel too and It felt very chilled to be out in nice winter sunshine, with lots of dog walkers and families out walking past the crag for a new years stroll. But as soon as I put my rockshoes on and climbed a bit on the route, my focus changed from having a non-committal play on a sick hard route, to psyched up and planning my lead. How easily I slipped back into normal mode! I was pretty shocked to find I could do all the moves on my first try and didn’t actually fall off any moves, just rested on the rope to scan the rock for the next tiny dinks for my feet. On new years day I hung on the rope and fiddled with gear, finding I could get 25 runners in the route’s 50 metres - not bad. On the third day I linked the entire route first try for my warm-up, and it was on. I knew fine well what Tim would say if I were climbing with him - ‘Get it led mate!! !’ So i headed back to Devon for the fifth day with that statement in my mind. It was simple really, I knew I could do it, I just needed to forget about all the hype that it was so hard and trust my own experience. Midday the next day brought the heady heights of +2.5 degrees. Balmy. A slight change in the breeze had dried more of the winter dampness off the route than before and I was repeating ‘get it led mate!’ in my head and imagining Tim laughing his head off at my lack of confidence. So I warmed up with a few pull ups off a boulder, tied in and led it. After the first crux I spent twenty minutes standing on my heel on a good hold frantically rubbing numb hands and wiggling chilly toes. 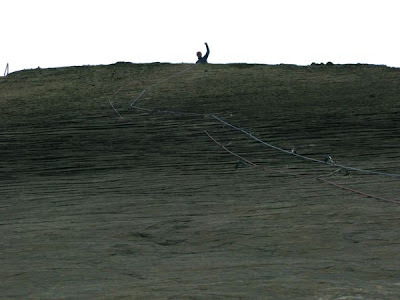 But this farcical situation of standing on one leg in the middle of a huge blank wall waving limbs about broke the tension nicely for the upper crux. I was placing more gear than James, but very nearly blew it right where James took his fall by clipping a runner with the wrong rope and only realising it when the rope drag suddenly became rather terminal and I had to reverse a move and wobble around fumbling to get the right rope clipped. As we started the long drive north again, I felt really happy to have shored up my confidence and to have enjoyed a great climb (thanks to James) that I would otherwise have missed out on. Injury rehab is always a right rollercoaster of emotions. 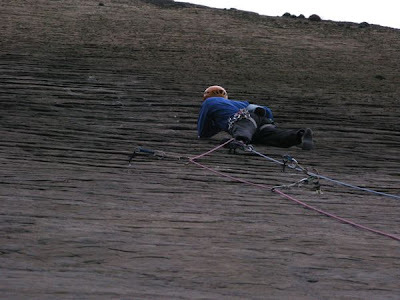 Now, as far as the climbing and personal experience is concerned, thats enough about that for now. But I know that the first question that I’d get asked about this climb by many climbers is “What grade did you think it was?”. regular readers will know that I’ve pleaded before that this needn’t be the such an important part of the story. However, for many, it is. So the best way to deal with the lingering question is head on and with some detail to help you understand where these thoughts come from. So if grades are your thing, sit down with your favourite tipple and follow me on some E-number crunching. Lets start with the bottom line; In my opinion The Walk of Life is solid E9 6c. Why is it not harder? Well basically it’s just nowhere near hard enough to be E10, never mind E12. In the current climate of big e-grades flying about E9 might sound a tad undeserving of a fat headline and magazine splash. But this is not true. A solid E9 ascent is still an incredible feat of rock climbing skill and, yes, it’s still world class. In my opinion it’s still waaaaay harder to live in Britain and climb E9 regularly than to hang out in Spain and knock off 8c+s back to back (thats why no-one has achieved it yet). And another thing is that a first ascent of a trad route at this level deserves extra respect over and above repeats. For James to come to this blank canvas of a wall and have the courage to see past all the uncertainties and unknowns to make a route is a brilliant achievement. But although trad climbs truly deserving of E9 and above are still very few and far between in the world, there are some, and they’ve been around for a while. The Walk of Life stands among these routes, not above them. The first reason the walk isn’t harder than E9 is there is no requirement to be fit. It’s possible to take both hands off on almost every move (not that you actually would, but the point is it’s not at all strenuous). Apart from the start which is rather sparsely protected, the remainder is pretty safe with many pretty good bits of gear, right where you need them. It’s also on a very non serious outcrop which is easily accessible with no logistical hassles. It’s kind of hard to give it a french grade but I would say about 8a/8a+ but I’m pretty sure there are harder granite slab routes in Switzerland and the US which are given lower numbers than this. Slabs are a weird one. On rock, I’m no slab expert to say the least, but I’m used to three or four hour leads on winter pitches of a similar angle and character. It’s a particular type of progressive climbing you get used to and eventually good at. Certainly the walk felt about the same as leading VIII or IX onsight and was an easier and much shorter battle than Yo Bro a few weeks ago. When I did the walk, I had Julian Lines and James McCaffie in my mind. They are the masters of this genre. I’m thinking now that Andy Nisbet might well be right when he commented in the Cairngorms guide that Britian’s hardest slab climb might be Icon of Lust. So what about comparisons to other routes? Well, The Walk is definitely not as hard as the benchmark E9 from way back in 1992, If Six Was Nine. It’s about the same difficulty and character to my own route Holdfast in Glen Nevis, but much easier than To Hell and Back and a couple of grades easier than Rhapsody to lead. Please understand that these comparisons are for me only. They fit with my skill set, my background, my strengths and weaknesses. There are so many ingredients to hard trad, hence these climbs feel pretty different to different climbers. The only way these grades will settle is with consensus, and that only comes when climbers make the effort to repeat each-others climbs and contribute to the refining. That takes a bit of commitment. 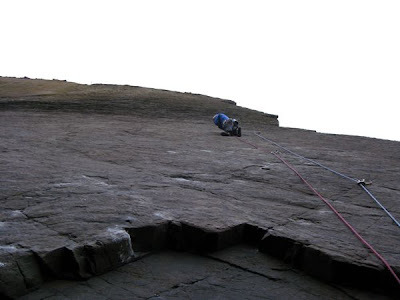 Sonnie showed it by coming back and finishing Rhapsody, The American team showed it by cleaning up gritstone. It might seem as if I am a harsh grader, having downgraded a few trad routes now. But the fact is it’s my opinion some of them have been overhyped when they are not as hard as others hard routes that have been there for a good while such as if6was9 or Widdop Wall. 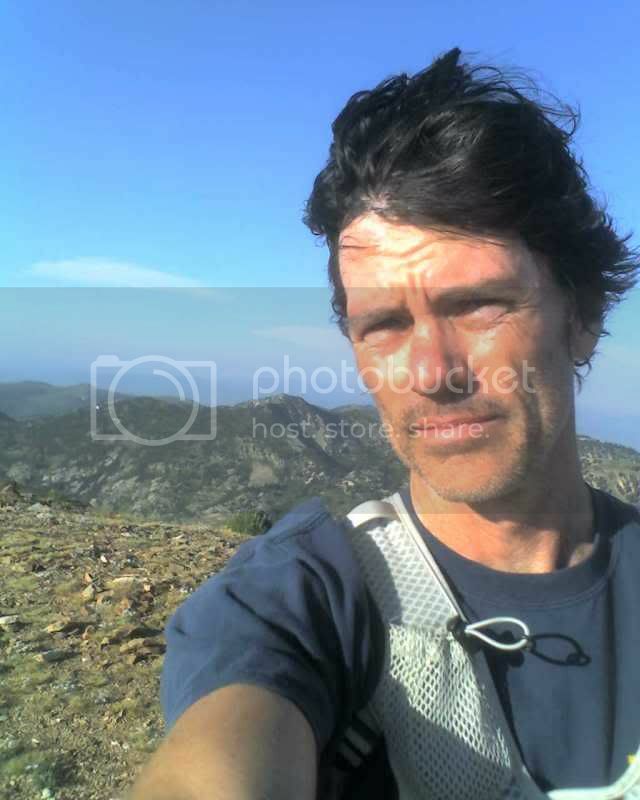 At the end of his blog post on the first ascent of The Walk of Life, James Pearson said “do the walk”. Walk the walk before talking. I know my picture of which routes are the hardest and where the current limit lies is different from some others, but at least it comes from direct experience of going out there and repeating all these climbs before comparing them. I don’t think it’s such a surprise that some that have been given the highest grades aren’t actually the hardest. There are too many aspects of human nature at play, never mind the fact that no-one has gone round and repeated them all. Climbers used to do this. Maybe they should do it again. 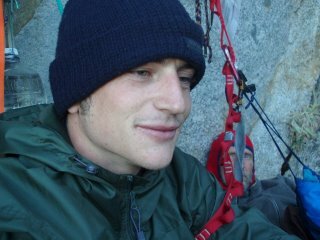 It would be a shame if our hard E grade climbs, which really are great masterpieces of rock climbs and stories, implode into a black hole of sensationalist rubbish headlines and witch-hunts on ukclimbing.com. At the end of the day, the grades are just numbers and keep climbers in idle chat between real experiences. What’s left are the climbs and the stories. A huge thanks and congratulations to James Pearson for his brilliant effort of climbing The Walk of Life. To climb this route as a first ascent is among the finest ever trad climbing feats. And I, and everyone else who cares to click in his direction owe him a huge debt for sharing the story of it’s first ascent in real time on his blog, through failures and the grinding effort of making something like this happen. I read, and was inspired. And for every one who tells you they were James, there will be another hundred who don’t. But they are there. I enjoyed doing the walk tremendously, and I wouldn’t have had that were it not for James’ effort. COngratulations. Im happy to read this. Get a house in madrid and thousands onf rutes 45 min from home! And I'm very pleased with the way in which you give your feedback to James Pearson! Well done Dave! Brilliant achievement in temperatures that leave most of us running for the warmth of the pub! Your attitude to climbing is as inspirational, if not more so than your actual achievements (of which there are many). You seem to climb with just the right motivations and with an outlook that doesnt leave space for grades, reputation or other less important stuff, concerning yourself only with the enjoyment of the climb itself. I guess thats why you get rewarded with so many great ascents! I always enjoy reading and hearing your accounts, and I think it would even be inspiring to hear you talking about a VDiff at Stanage, never mind world class ascents in such dramatic settings! I first heard of you watching a trailer for a film with a clip of you taking a 'Big Whipper' on rhapsody and it made you look like a bit of a twunt... But after reading your blog, and hearing so many stories, I only wish every climber was as honest to the sport as you. Fantastic effort, Good luck with the elbow injury and look forward to reading more of your exploits. Ah mate, you never cease to amaze us. Brilliant. I watched the DVD with great intent (and yes inspiration) but I couldn't help but wonder how the walk was E12 or even E10 for that matter. Thanks for clearing that up and making me feel less clueless than I already am, and you've done it with fine sportsmanship. What a beautiful looking climb. A remarkable effort. Wish I could give it a once over. Thanks for your words, your optimism and your honesty. I'm sitting here in a SNOW covered Squamish, praying for sunny days dangling off my hangboard. If you feel inspired, I would love to show you around here this summer. I have a couple of strong friends coming and maybe we could turn this place into a party. Safe travels and best wishes. Good luck with those minor tweaks. Please keep up the fine work, you will always be a hero of mine. Congrats Dave! So psyched to hear this story. It's been an interesting and tumultuous six months for yourself, James and E-grades in general. It's a shame what happens with the media and armchair climbers trying to play one off against the other. Ultimately, as you say, it's the climbers that go and repeat these routes who are actually entitled to a valid opinion as to their difficulty. Hats off to the respect you've shown James as well. A first ascent is always much harder than a repeat. Dave, you sir are a class act and a great blessing to the climbing community. Humility, respect and honesty like this should be observed, revered and practiced by all. May your tendons heal quickly! Keep calling them as you see em and enjoying doing what you're doing! Dave congratulations and thanks for the great post giving us insight into the route and your thoughts on the grade. I look forward to following what you get up to in 09! Wow .. awesome line, great photos and interesting write up. Perfect! Great to hear what you think. Congratulations on yet another fine ascent. I think your post was fantastic, showing great level headedness, and respect for James. Well done for stating your opinions on the grade - like all top climbers you should have the confidence to put a grade to a route without feeling intimidated by armchair critics and media hype. Well done and keep inspiring the rest of us! 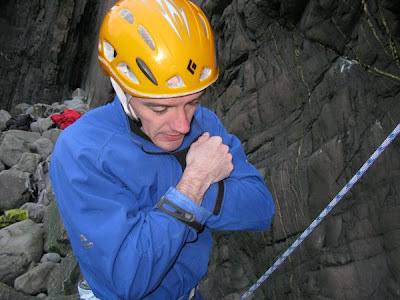 As a fellow sufferer of hot twangy tendons, I'm just flabbergasted that you could climb E-anything with a tendon problem, let alone TWOL, whatever grade it may end up being. Stunning stuff! Thanks Dave. Not just a phenomenal climber who can convey the experience so inspirationally in words, but a gentleman too. Glad you enjoyed the climbing and found the right project to get you going despite the injury. Although you feel that grades need not be such a crucial part of the story. When discussing grades you always give such a rounded and well grounded view that only someone with your experience can do. Great effort, good to see a true all rounder. Limestone, mountain rock, seacliffs, winter. Still some gaps on grit as well. Wall left of the New Statesman is on apparently Big tick - 'Get it led'. Congratulations on another brilliantly executed headpoint. This is a great blog by the way especially your tips on training and treating injuries! On another note I was just wondering why you have deleted your 8a profile - it always gave me something to aim for! Sublime stuff Dave! Massively impressive to get down there at this time of year and repeat one of 2008's outstanding FA's. You never fail to suprise! Awesome work Dave! You continue to be such a huge source of inspiration and to repeat this route when you weren't 100% is just beyond my ken! When I saw the E12 in the magazines, I thought "I bet Dave M is gonna climb this". And now you have! How many people have climbed rhapsody after you? What have they said about the grade? I was hoping you'd do this soon to give us all an idea. Well done Dave! Big January E numbers!!? Theres nae stoppin ye man..
Great effort and a lovely bit of writing on your blog, informed, insightful and inspirational as always. All the best on the tendon rehab and for future lines.. I always look forward to reading about what you are getting up to. Reading your words creates a wonderful adventure in my mind. I sense and feel your excitement, your enthusiasm, and I can't help but be transported into your world. With regards to this latest climb I am so touched by your sense of dignity and humility when you talk about how it does not = E12. You have preserved the positive intention and integrity of James Pearson, with respect and true gentlemanship - a wonderful quality and a model for us all. The value you create is underestimated in my opinion. Personally, I feel that I get closer to the nature of the human spirit and to the beauty of our glorious Scottish mountains. More importantly, you are also teaching us about the 'power' we have in is to truly overcome challenges, and to achieve truly remarkable things. A great ascent once again Dave, congratulations. Your achievements, and humility in reporting them are always inspiring. Awesome work Dave! Your attitude and positive-focused feedback is so healthy and good for the whole of the climbing community. Best of luck in the new year!!! Awesome stuff! I can only agree with what others have said about your attitude... your dedication inspires me to push myself and achieve my own personal climbing goals. Nice repeat it looks desperate, I thought you hated slabs! Just out of armchair intrest, how does it compare to the Indian Face? Is it similar, but more technical and safer? Is it as snappy? Which would you say was better quality? Trully awesome - worthy of much awe and respect on our part. Amazed at the casual way you describe it all but yet not surprised that you've been and done it. And thanks for the way you wrote so well about it all and gave respect to James - heartening to see. You've been an inpsiration for me once again. I read with interest on you reasoning why you felt that the walk needed to be downgraded, in particular your thoughts that it doesnt require the climber to be fit, or specifically conditioned for the route( as you demonstrated by climbing it injured-well done by the way). I was wondering how this fits into the criteria in judging a routes grade, does this mean that all technical slabs are doomed to be downgraded just because they are not overhanging and dynamic? This seems to me on par with the reasoning that an E6 climber could downgrade anything below E2, because he finds it easier to climb than an E2 climber would. Or vice versa,an E2 climber upgrading an E6 because he cant climb it cause he gets pumped out. A climb does not change because the climber on it is fit, or unfit and I dont see how a climbs grade should change to reflect it. I would wager that if I were to attempt the route I would need to be a lot fitter than I am now to succeed. Im not trying to crtisis, just wondering how fitness requirments can determine an unchanging line and grade, when fitness itself is abstract and changes with each climber and each situation. a truly great route, put up by one of the best and repeated by one of the best, both with great style - well done. This is just wrong Dave! When I get a tendon injury I go fly my paraglider or something--now you've gone and climbed yet another ridiculous route with an injury? Hell, you're making all of us slackers look just like what we are--slackers! Come on, ease up man! Right, off to go hang on the board some more, this got me that fired up! As for the Tim motivation pounding in your head, YES! 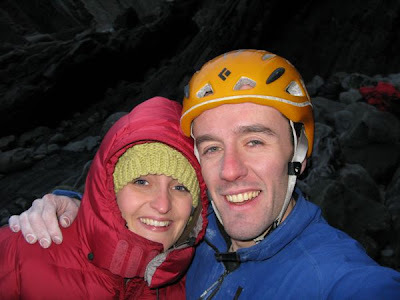 Nice one, and congrats to Claire on the belay too, not many couples doing what you're doing. To echo those other comments it's nice to see the deserved respect you give James having the vision and inspiration to make the first ascent of such an awesome looking route. Grades will always be subjective but interesting point made by Jono above about how fitness implicates the grade of a route...? 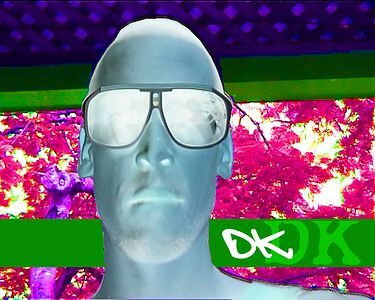 I enjoyed your write up Dave, many thanks for sharing your wise words and analysis. Excellent work, Dave, and a literate, thoughtful piece of writing. We met once in the northern corries and without knowing who you were I commented to my mate "He seemed like a very grounded and humble chap". You'd said some complementary things to us after we'd done some IV that you could probably do with your eyes shut! Some of the "blame" for the overgrading of JP's routes must rest on CLIMB magazine. They are the ones who devote 12 pages+ to his E10/12 ascents, while barely mentioning yours. Excellent analysis and narrative. I wish climbing media and more top climbers put the time and thought into their explanations of climbing grades. I am getting back into climbing after a 5 year break and look forward to visiting your blog frequently for such inspiration. Well Done, Laddie! And a fine job of keeping the ego in check while downgrading another fine climber's route. Cheers. Happy New Year, man! Brilliant piece of climbing. Superb analysis.